Obesity In Children And Teens Rose Sharply Worldwide Over Past 4 Decades : The Two-Way The number of young people with obesity has risen tenfold since 1975, according to a study from the World Health Organization. At the same time, that rise has been far from uniform across the world. In just over four decades, obesity levels in children and teenagers have risen dramatically worldwide, though that rise has been far from uniform. In a new study published online Tuesday, British researchers and the World Health Organization say those levels have plateaued lately in high-income countries, "albeit at high levels," while the rise in obesity rates has only accelerated in regions such as East Asia and Latin America. All told, researchers say their analysis of body mass index trends in more than 2,400 population-based studies from 1975 to 2016 — including more than 31 million people ages 5 to 19 — reflects a divergent world: The number of girls and boys with obesity worldwide increased tenfold over that period, from 11 million to 124 million, and at the same time the number of underweight young people remained higher, at 192 million, despite a slight decrease since 2000. Over the same period, the prevalence of obesity rose worldwide from under 1 percent for both girls and boys to 5.6 percent for girls and 7.8 percent for boys. If recent trends continue, researchers note, "child and adolescent obesity is expected to surpass moderate and severe underweight by 2022." Both ends of the spectrum carry their own health risks. Obesity has been associated with chronic disorders such as Type 2 diabetes and high blood pressure, while underweight is likely to increase one's chances of catching infectious diseases, among other potential problems. The rise in obesity "is a huge problem that will get worse," Harry Rutter, an obesity researcher with the London School of Hygiene and Tropical Medicine, tells the BBC. "We have not become more weak-willed, lazy or greedy. The reality is the world around us is changing." 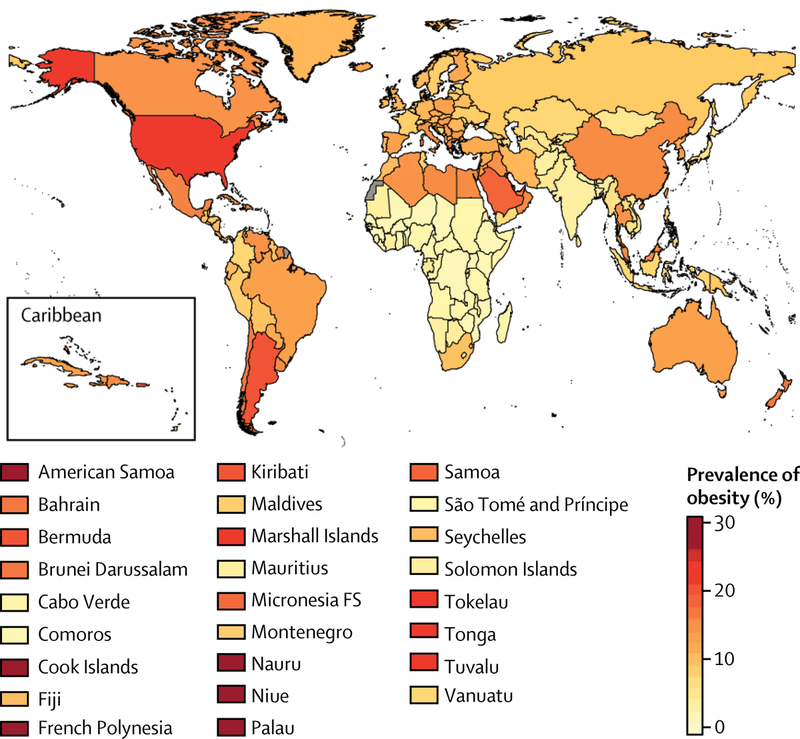 According to the study, obesity prevalence is generally highest in the South Pacific, where it reached more than 30 percent among both girls and boys in the Cook Islands, Nauru and Palau in 2016. Those numbers are also high — above 20 percent — in the U.S., Egypt and Saudi Arabia, among several other countries. Not to single these countries out, though: "From 1975 to 2016, obesity prevalence increased in every country, although the increase was not statistically significant in some high-income countries," the researchers found. On the other end of the spectrum, South Asia — and especially India — had the world's highest prevalence of underweight children and teens. So, what to take away from the study's findings? The study's authors see reason for cautious optimism in the flattening obesity trends in the world's high-income countries. "This shows that something can be done about obesity, but it might be an exaggeration to call this 'good news,' " author Majid Ezzati of the Imperial College London tells The Associated Press. "These are still pretty high levels and we don't want it to stay there; we want it to go down." At the same time, the rise in obesity elsewhere in the world offers a warning sign, as the authors observe: "Unaffordability of healthy food options not only leads to social inequalities in overweight and obesity, but might also limit the effect of policies that target unhealthy foods." They say a lack of access to quality health care, too, can exacerbate the ties between inequality and obesity. "There is a need for bridging the disconnect between policies that address underweight and overweight in children and adolescents to coherently address the large remaining underweight burden while curbing and reversing the rise in overweight and obesity."